After getting fairly annoyed / disappointed with the recent series of major label “deluxe reissues” (Nirvana, Pink Floyd, etc. ), Deep Purple’s The BBC Sessions 1968/70 is a welcome change - along with being a great addition to the band’s extensive catalog. It isn’t quite fair to call this 2CD set a “deluxe reissue” but about half of these tracks had circulated previously on various compilations and reissues. 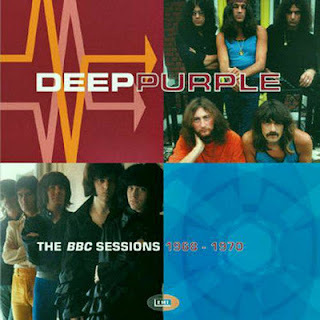 This is the first time though that ALL of Deep Purple’s BBC session that were recorded between 1968 – 1970 have been released in chronological running order. Disc One chronicles the band’s under-documented Mk 1 line-up's sessions for the BBC. Disc Two douments the early days of the Mk 2 lineup and captures this lineup prior to their initial studio release (In Rock) with a session that took place less than two months after the Mk 1 lineup came to a close. This 2CD set also comes with a 10-page booklet that details each of the sessions and the songs played. The sound quality on Disc One varies (depending on the source material) but the flaws are minor. The sound quality on Disc Two is “pin drop” perfect. - "One More Rainy Day"